Shoulder Screws, also known as Shoulder Bolts, are used for several different applications, including those that involve rotation or require a locking type of screw. 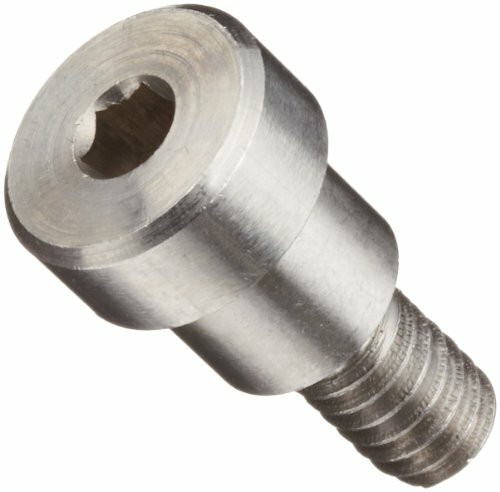 Shoulder Screws are distinct from other types of screws due to the fact that they are only partially threaded, leaving a smooth-sided round or square shaft between the threading and the head. This shaft is usually slightly larger than the threaded portion of the screw. Often used in automotive and mechanical applications. Stainless steels are used for their corrosion resistance, high-temperature strength, scaling resistance, and low-temperature toughness. These properties account for their extremely wide use in practically every industry. Austenitic Stainless Steels are alloys of iron and carbon that contain between 16% and 30% Chromium, a maximum of 0.15% carbon, along with Nickel (or Manganese), and other alloying elements. The chromium, which helps develop a passive surface oxide film, provides corrosion resistance in stainless steels. Austenitic Stainless Steels are designated by a 3 digit SAE Stainless Steel Grade beginning with the number 3 (e.g. 304, 316). Stainless Steel 303 contains 0.15% carbon, along with traces of sulfur and phosphorus which makes this a free machining alloy. Free machining refers to the ability to cut and finish the materials without heavy wear on the machining tools. Tensile Strength is 35000 psi (pounds per square inch). With a high cylindrical head, socket cap head fasteners have a recessed driving area and offer high hold power at high torque levels. Hex socket drive systems are driven by hex wrenches or power tools with hexagonal bits. A threaded fastener's size name includes information about the major external diameter, followed by the threads per inch, which indicates if it is coarse or fine. Coarse threads are better when working with brittle materials; they are sturdier and are easier to thread and unthread compared to fine. Coarse threading also allows for thicker coatings and platings.